Is the end of the year a crazy time or what?! I did not forget about wrapping up this series...I just got caught up in the craziness! If you've missed any previous posts, you can find them below. Here's a pic of it in action. It sits in the very front of my lesson plan binder. It gives me a glimpse at what units I'm currently teaching (or are coming up next) as well as important dates/events. You can see that I cross the day off each morning. :) I created this (years ago) in Microsoft Word. It's just a table that I merge and fill for my needs. 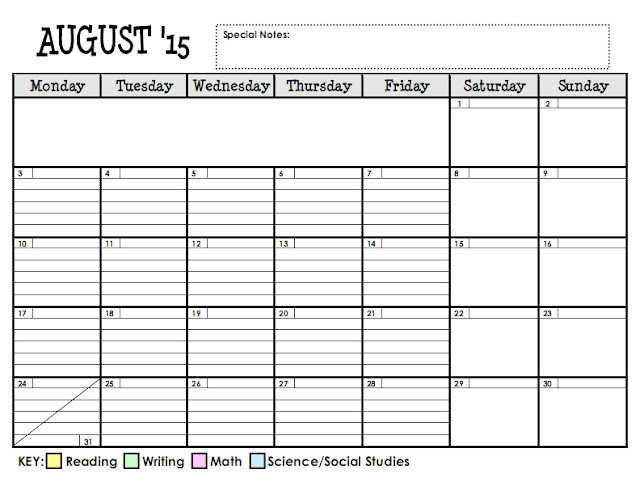 I begin with our district's calendar and add all of the important dates (such as teacher workdays, report cards, holidays, etc). Then, I add in other holidays that might be of importance at school and things like daylight savings times...which are important to me. Then, I add in birthdays for my team members and hall duty (HD) assignments for us. Once all of these are added, I add in my units of teaching to correlate with the key at the bottom. This just makes it a really handy, at-a-glance document. I also add in a flexible "read-aloud" schedule in the top section. 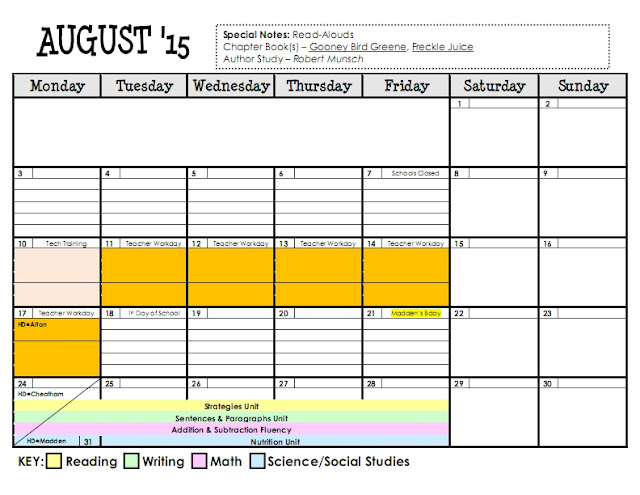 This is totally flexible, but I like to have my read-alouds mapped out for the school year. I have a small block set aside for read-aloud daily (usually after lunch or recess). During this time, I'm either reading a chapter book aloud or books by a particular author (and we look for his/her "fingerprints"). You can download my entire PLANNING CALENDAR HERE. 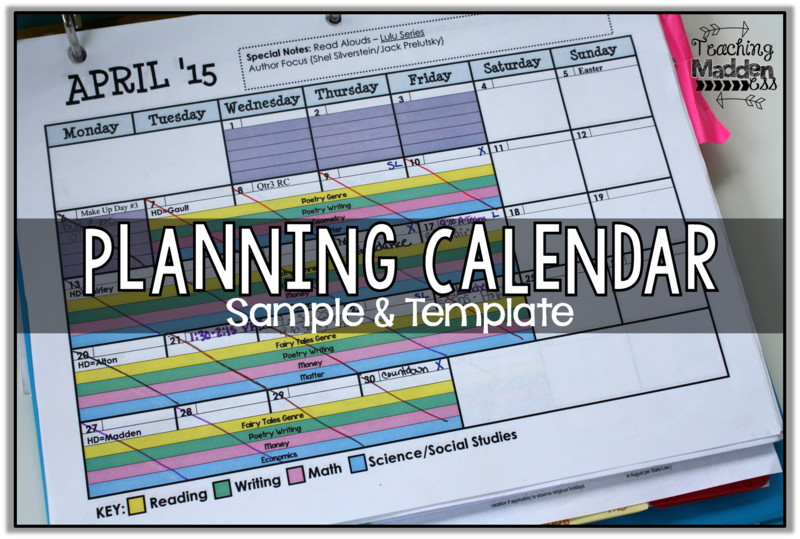 If you'd like to try to map out your school year with a planning calendar, you can download the Microsoft Word template that I begin with HERE. Loving your calendar, Amanda! Thanks for sharing:) T shared it with us last year and it is our "bible"as well. Happy Summer! Do you have a sample of your weekly lesson plans? Thank you so much for this!! It is absolutely priceless!! You are you so organized.. and so helpful.. I've been teaching a number of years and this is my 5 year teaching grade 2. For the first time I have also a few grade 1s. I'm trying to organize my year for a supply teacher to begin since I'm not going to be able to be at school at least for a while. My husband is very ill - just diagnosed in June with cancer and it's not good. This sure helps me get things organized for someone to come in and take over my class. Thank you for sharing so much!! This is all amazing! !